Written by Janet Choi on April 6, 2016 . It’s a great gold bar. We’re not satisfied if someone signs up and starts using Slack. We’re not satisfied if they become a customer. We’re not even satisfied if they renew. Our bar is ‘Are they going to recommend us?’ And that’s a much higher bar. 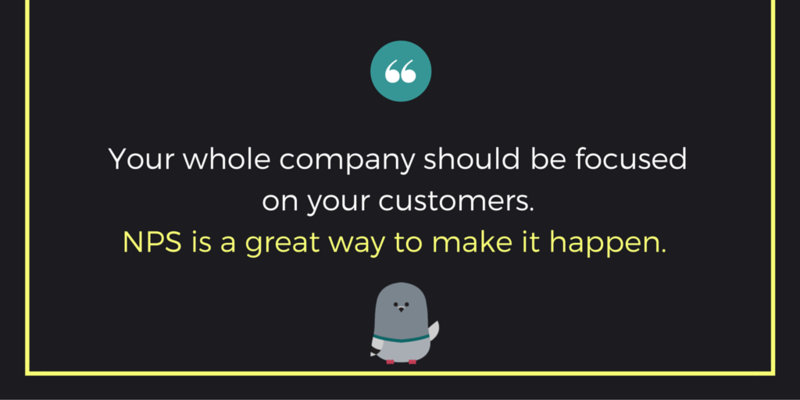 Your whole company should be focused on your customers, and NPS is a great way to make it happen. Don’t just run a business or sell products. Aim to create an experience your customers will never forget. We’ve already covered some of the basics of net promoter score and ideas for following up with your respondents. Here, we’ll go over 5 practical considerations for running your NPS surveys to best find and follow your north star metric. Customer sentiment changes rapidly, typically in correlation to how often the product itself matures. This is why NPS is a routine measurement and is often measured quarterly. If you don’t measure NPS regularly, you will miss opportunities to proactively engage customers based on those changes in sentiment. A regular survey cadence creates a positive feedback loop for growth. You stay aligned with your customers and continually improve on their experience. Don’t batch and blast your NPS. While sending bulk NPS surveys is probably better than not asking for feedback at all — it’s best to avoid big batches. Batch-and-blast surveys will reach people at different stages of their lifecycle. Instead, approach NPS surveys like a behavioral drip email series that triggers based on user lifecycle stage, account state, or plan. Each user can then respond to the NPS survey at comparable points in their experience rather than an external, random timetable. This method is more consistent and gives deeper insights beyond whether someone is a promoter, passive, or detractor on a certain date. For instance, you can see better data on how the opinions of specific segments like new users versus longtime promoters change after an product update. The best practice we recommend is the combination. First, run the in-app survey, and if the user doesn’t respond after couple of weeks, send the email survey. That’s when we started to get around this theme of all your communications in one place. We consistently saw that’s why people were recommending us… A lot of that came off of the NPS survey and understanding why people like Slack — and conversely what were the areas we can improve and routing that to the product team in making sure it’s a good holistic feedback loop. 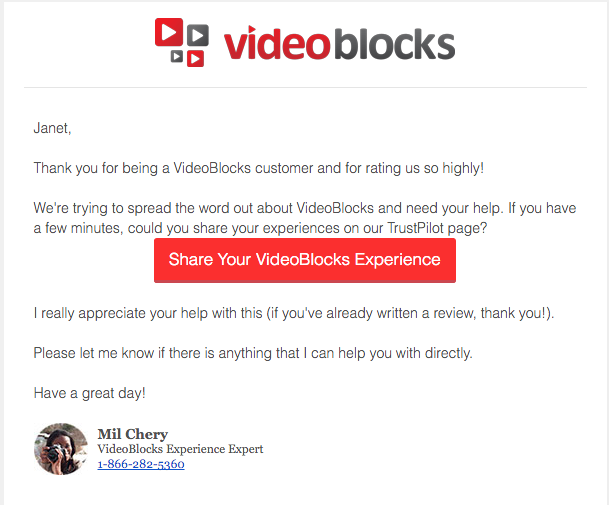 Promoters are asked for a review of Videoblocks on Trustpilot. Passives receive an exclusive bonus pack of footage filmed by the company’s founder. Detractors see a message encouraging them to get in touch to address their dissatisfaction. “The follow-up is important because people want to be involved,” Amy explains. “They want to know that we’re something with the feedback they give us. 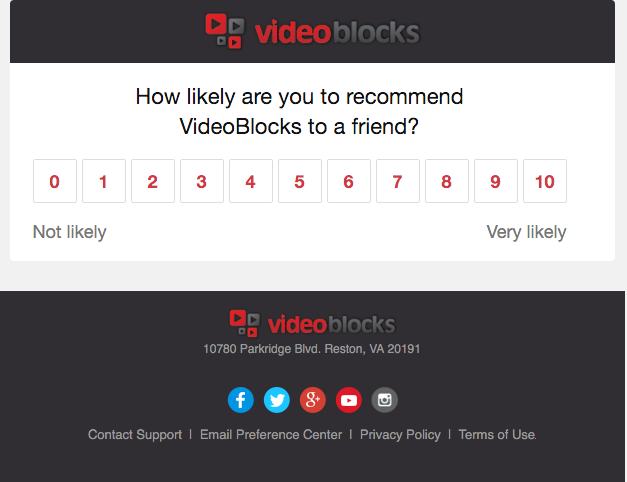 Also we can use NPS as a chance to win back people.” The VideoBlocks team schedules and segments the surveys according to lifecycle intervals and subscription plan. For example, trial members see their first NPS survey 6 days after signup (a day before their trial ends) whereas annual members see their first survey at 30 days. By dripping the requests according to user context, instead of doing intermittent batch-and-blast campaigns, “we get people in the same step or time period of their experience,” Amy explains. The team examines the scores and feedback once a month, tracking the results over time and looking for themes in the open comments. Recurring NPS surveys also help identify and check in on specific features and issues. So if complaints about searching on the site resulted in revamping the search function, the team can tell if they actually made customers happiers from the surveys before and after the changes. “NPS is a great indicator of happiness,” Amy sums up. One important takeaway, according to Amy, is that customers who complained the most also tended to be the most engaged. Complaints, while negative, mean that people care — and that’s something you can work with. In fact, it’s the middle-of-the-road passives you might be most nervous about — which reinforces the lesson to be especially thoughtful about how you engage your passive respondents. In trying to improve a product or business, comparing your NPS results to average benchmarks can be misleading, from apples-to-oranges comparisons, or unhelpful, from lack of context. Instead, benchmark against your own past performance to see whether you’re making progress. However, you may find these general benchmarks useful as a starting point to shape your expectations and set goals. In one report, Zendesk found that product type affects overall NPS scores. The highest ratings went to teams serving other internal departments, while B2C companies tended to see higher scores than B2B. Zendesk also measured median open comment rates in their study and found that people who had stronger opinions tended to leave open-ended feedback more often. Detractors also provided longer and more detailed explanations of their ratings. As Videoblocks found, people who have complaints care and providing the opportunity to voice those thoughts in turn enables you to make improvements. If you have users in more than one region, take care to consider cultural differences in how people rate on a numerical scale, as that may change how you define your NPS segments. When he was heading up growth at Mention, which makes a media monitoring tool used across the U.S. and Europe, Guillaume Cabane figured out that the NPS ratings scale across the two regions wasn’t consistent. A 7 in the U.S. did not mean the same thing in France. He explains that he would define European customers as quite happy promoters, even if they gave ratings of 6 or 7. Why is this important? Your core goal is really about making sure you understand what your customers are trying to communicate to you. And second, as Mention found, incorrectly interpreting promoters as only 9’s and 10’s across the board meant that they were missing potential upgrade opportunities. When implemented well, NPS surveys provide the information you need to power improvement throughout a company, create amazing customer experiences, and grow your business. How does your team run NPS surveys?